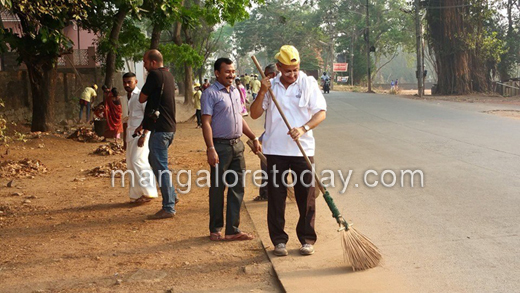 Mangaluru, Mar 30, 2015 : Swachh Mangaluru for Swacch Bharath - cleanliness drive on ninth consecutive Sunday, March 29 was at Morgan’s Gate. Swami Jitakamanandaji, president of Mangaluru Ramakrsihna Math and J R Lobo, Mangalore City South MLA, Ganesh Karnik, MLC, participated in the programme all through motivating the volunteers. Students of Government First Grade College, Car Street cleaned the bus stands in the locality and painted them. Students of Ramakrishna Mission Balakashrama cleaned the garbage and distributed awareness literature among the public in that area. 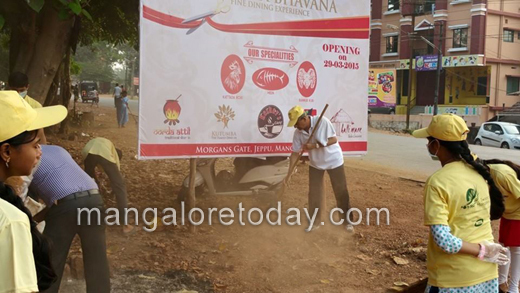 Devotees and well-wishers of the ashram cleaned the roads leading from Morgan’s Gate to the Highway. This week’s special focus was cleaning and beautification of the two bus shelters in Morgan’s Gate, clearing the dumping yard and roads from garbage. Fixing three boards indicating distance and direction of different places at the junction circle, replacing the broken slab of the incomplete footpaths with new slabs and so on. 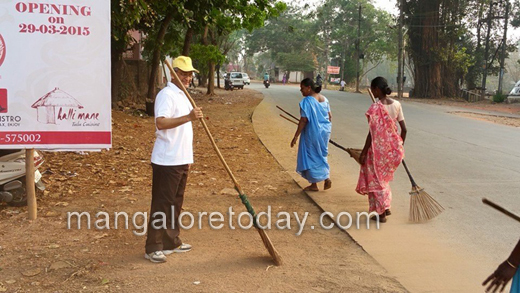 This is a part of the 40 weeks cleanliness drive being organized by Ramakrishna Mission and initiated on February 1. Under this the student volunteers assemble in the ashram on Saturday evenings for an evening retreat - Swacch Manas where they are taught meditation, bhajans and inculcation of values of social responsibility.